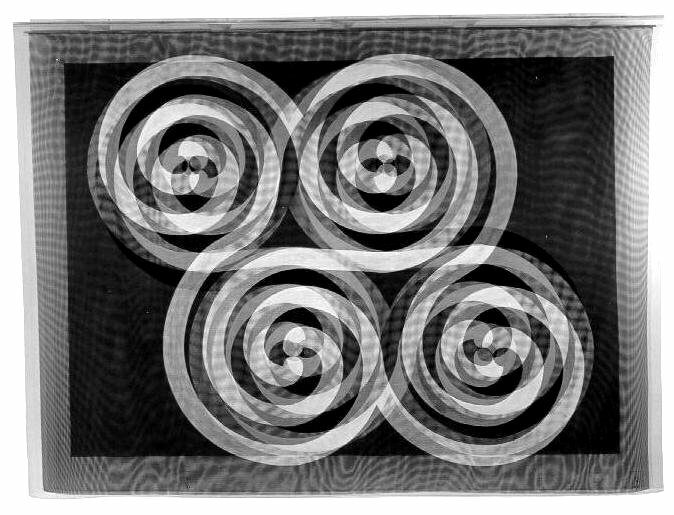 SPIRAL II, III, IV, 1997, measure 84"x 112"x 10". In order to achieve the three-dimensional illusion of these spirals in space, I had to overlap three layers: while keeping the centers of the layers parallax, the design of each individual layer was changed. On surface one, spirals were moving clockwise; on surface two, circles within circles of the same distance were applied; on surface three, spirals were repeated as on surface one but mirror-reversed and moving counter-clockwise.